Young woman from Bissau votes in the legislative elections. 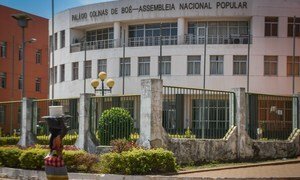 The UN’s Deputy Special Representative in the West African state of Guinea-Bissau, has congratulated politicians, voters and officials across the country for the peaceful conduct of Sunday’s national assembly elections. The United Nations, as expressed in a recent Secretary-General’s report published in February and a Security Council resolution approved last week, has high hopes that this vote will help to end the political crisis that has rocked the country since 2015. That year, then President José Mário Vaz, dissolved the government of Prime Minister Domingos Simões Pereira, whose party had won a majority in the 2014 elections. Since then, there have been seven different heads of government. Preliminary results are expected on Monday night, and the official tally should be announced on Wednesday. The party that gains a majority of the seats will be invited to form a government, according to political convention. At a press conference held as polls closed on Sunday, a spokesperson for the National Election Commission, CNE, said the voting had happened in a “calm, very serene” way with “acceptable” turnout, even though final results will not be known for some days. Early in the morning, inside some of the capital’s hotels, more than 130 international observers started being dispatched to every one of the eight regions of the country of 1.9 million people. There were 21 parties running, the biggest number in the country’s history. Currently, only five parties have seats in the Assembly. Throughout the day, the election was monitored in various parts of the capital by various organizations, including civil society groups. At its headquarters, UNIOGBIS set up a situation room with several members of its staff, who followed the latest news and information received from the regional delegations. The same was true of the Electoral Process Monitoring Cell, which was set up with UN support, where constant updates from 420 monitors were analyzed. One of the key national concerns prior to the vote centred around electoral lists. In recent weeks, there had been some controversy over voters missing from official registers, despite having voter identification. Last week, CNE, with the approval of every party, decided they wouldn’t be allowed to vote. On Sunday, the Commission said only around 2% of voters were effected. In Santa Luzia, one of the biggest neighborhoods in this city of close to 400,000 people, UN News saw voters started lining up along its unpaved roads before the booths opened at 7am local time. At 5pm as soon as the voting ended, the counting began. In one of the most popular voting places, by the National Heroes Plaza, one of the electoral officers gave results in real time, by holding up a ballot, announce the result, and showing it to everyone gathered around. At the end of this process, which took close to two hours, the results for that location were posted on a nearby wall. As the sun was setting, people would stop to look, make some comments, and keep walking up toward the Presidential Palace, just a few hundred feet way. When it comes to the new occupant of that building, the people of Guinea-Bissau should choose its new resident, by October or November this year. After months of preparation by hundreds of national and international officials, including the United Nations, around 760,000 registered voters from Guinea-Bissau headed to the polls on Sunday to choose new members of the National Assembly.